﻿ DIVINE IMAGING, INC. DIVINE IMAGING, INC.
Divine Imaging, Inc. is a U.S. Federal Government vendor holding multiple GSA, DoD & DLA contracts. Divine is a certified small, woman-owned, disadvantaged VAR (value added reseller) helping government buyers meet their small business set-asides and socio-economic goals & mandates. 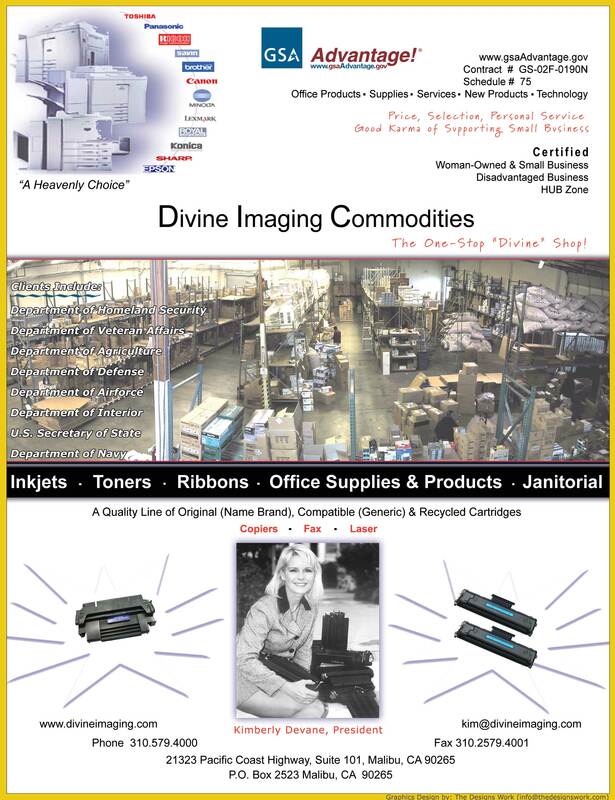 The Divine Team has positioned itself to be a "one-stop-shop" to federal government, civilian, and military buyers by offering a wide array of Office Products, IT Equipment, Consumer Electronics, Hardware, Hospitality, Safety & Survival, Tactical, Paper & Break-room Products, Green/Recycled Items, Janitorial/MRO Supplies, Packing & Shipping Goods, and other services and merchandise. Divine holds (6) GSA & DOD Contracts: 58 I (GS-03F-069AA); 75 (GS-02F-0190N); 70 (GS-35F-0422T); 51v (GS-21F-0155W); 73 (GS-07F-0462W); 81 I B (GS-02F-0164W). Additionally, we hold four (4) DLA Milstrip Contracts, (4) TXMAS contracts, multiple BPA's, IDIQs, and Commodity vehicles. Divine Imaging has achieved a 96% past performance rating and is fully integrated into the Federal Sector as a Prime Contractor, Subcontractor, Cooperative Purchasing Partner for State and local governments, and a Teaming Partner to many other large Government Contractors and Veterans as needed. The Divine Team provides same-day quotes, impeccable customer service, and can fulfill all of your products and supplies needs, while helping you meet any socio-economic, diversity mandates or small, woman-business goals you need to achieve. Divine sells Everything! How can we help YOU? FOB standard UPS ground shipping in the continental United States or as needed. Purchase and Impact Credit Cards, EFT, WAWF, FEDPAY, GovPay, Milstrip/Fedstrip, Net 30. California Multiple Award Schedule (CMAS) can be used by any State of California department, agency, or district (e.g., Fire and School Districts) as well as by any city, county, or local government. Divine Imaging, Inc. has now been awarded four (4) Milstrip IDIQ/Blanket Purchase Agreements (BPA) by the DoD/DFAS/DLA/ DSCC. DoD customers may now buy Divine products with MILSTRIP or FEDSTRIP funding and purchase up to $150,000.00 on a single order or $5,000,000.00 using other Acquisition Procedures on FedMall. Divine Imaging, Inc. is a "one-stop-purchasing-shop" offering a wide variety of competitively priced IT Equipment & Computers, Consumer Electronics, Office Products, Janitorial Supplies, Furniture, Ink and Toner, Hardware, Packing and Shipping Supplies, Food Preparation Equipment, Break-Room Supplies, Tactical Items, Safety PPE, Law Enforcement Milspec Goods, and other merchandise. Products priced above the $3,000 dollar threshold can now be purchased from Divine on FedMall, and can be found by searching the appropriate contract number (see above) and/or using the keyword Divine, along with the product number/description that you are seeking. Please call us at 310-579-4000 for Divine DoD ordering instructions. Divine Imaging, Inc. is proud to have been chosen as one of only a very limited number of carefully screened vendors to be awarded (4) DFAS/DoD/DLA/DSCC Milstrip contracts. The Divine team has worked hard to obtain these contracts with the goal of providing greater product selection and expanded purchasing options to our valued federal government customers, while helping them meet their 37% socio-economic and small business set-aside goals! Please search for Divine products at FedMall, and as always, feel free to send us your RFQs for prompt and competitive quotes on the products that you need. Let us know what you need and how we can help you with Fiscal Year End Spending! Divine sells everything! What else do you need?